"Link to the Past 2" not only got a name, but a new trailer! Nothing dramatically new was shown off, mostly the same stuff that we have seen before, but it's still worth checking out. 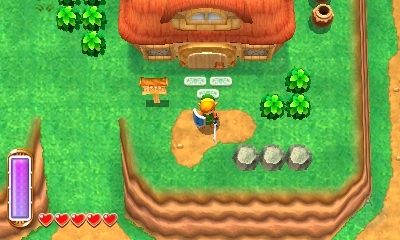 The Legend of Zelda: A Link Between Worlds is slated as a 2013 release. I like how zippy this game is. I prefer the zippier Zeldas. Yeah, the game having the same overworld totally blows, but at least the dungeons look good. The new title works, too. It didn't show very much, so it really hard to judge what the whole game is going to be like. Looks like a solid entry. I prefer this over Wind Waker HD at this point. Rather have sprites, but I'll take it. I'll keep an eye on this game. A Link To The Past is my personal least-favorite entry in the series, but maybe this newer version with new abilities and dungeons will appeal to me more. Yup, same here. 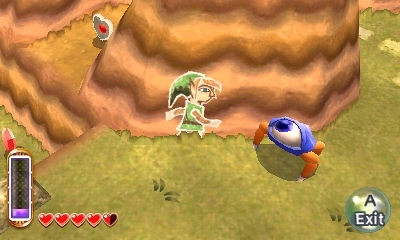 The Wind Waker HD port is totally unnecessary, TBH. Agreed, I'm much more looking forward to this. The Wind Waker is my personal least-favorite entry in the series (sorry for stealing your quote @GameDadGrant, but it worked! ), so the remake only really would interest me if they made a number of improvements to it beyond the visuals -- which is one of the few things I actually did love about the original. This will give me my Zelda fix for this year. See the Triforce? Dark World is back baby!! There's still something big that they aren't telling us about this game... Aonuma did mention some shocking surprise after all. There's no way that it's going to all be the same light and dark overworld. I bet the new overworld lies... between the worlds. Oh! The new trailer is underwhelming. Wait!! What if between worlds, they mean timelines?! In other news I now like the art style. They gave it a bit of much needed polish and shaded it a bit more. Am i the only one getting a MEGA PAGE STRETCH? I thought Zero fixed this? Just right click and open image in new tab. Not the point. The point is page stretching. Edit your post! I got to thinking, it would be a lot more appropriate if A Link to the Past and A Link Between Worlds had their subtitles switched around. I played A Link To The Past *after* I had already played Link's Awakening, so playing the older game afterwards felt less significant.